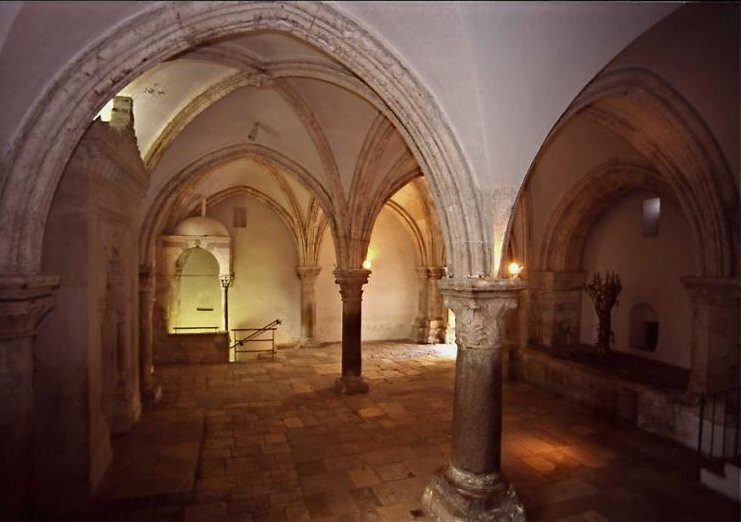 The Cenacle room on Mt Zion in Jerusalem is where two major events in the early Christian Church are commemorated: The Last Supper and the coming of the Holy Spirit on the apostles. • The Last Supper was the meal Jesus shared with his apostles the night before he died. During this meal he instituted the Eucharist. • The coming of the Holy Spirit, at Pentecost, is recognised as marking the birth of the Christian Church. 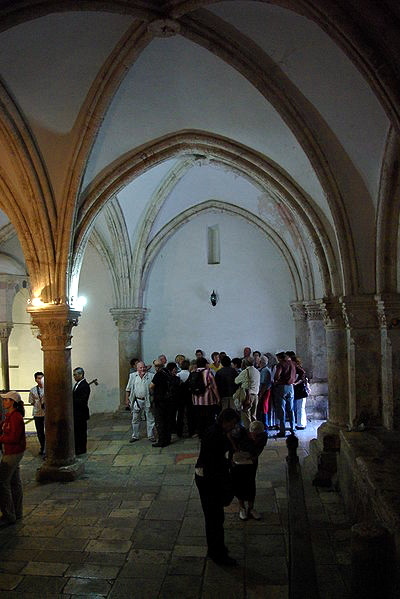 The Cenacle is on the upper floor of a two-storey building near the Church of the Dormition, south of the Zion Gate in the walls of Jerusalem’s Old City. Above it is the minaret of a Muslim mosque; immediately beneath it is the Jewish shrine venerated as the Tomb of King David (though he is not buried there). The Cenacle is not universally accepted as the site of the “upper room” mentioned in Mark 14:15 and Luke 22:12. But archaeological research shows it is constructed on top of a church-synagogue built by the first-century Jewish-Christian community of Jerusalem. Fragments of plaster have been found with Greek graffiti, one of which has been interpreted as containing the name of Jesus. This would have been the first Christian church. The only competing site is the Syrian Orthodox Church of St Mark (also on Mt Zion), which also claims to possess the “upper room”. Wherever the site, the original place of the Last Supper would have been a simple dining hall — quite different from those depicted in paintings by Leonardo da Vinci and other artists. The present Gothic-arched Cenacle is a restoration of a Crusader chapel built in the 12th century as part of the Church of Our Lady of Mount Zion. Among the architectural details of the Crusader period is a slender marble column supporting a stone canopy in the south-west corner. 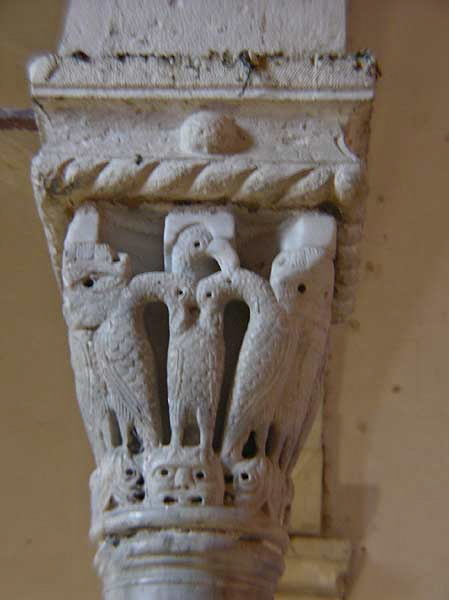 Carved into the capital at the top of the column are two young pelicans feeding on the blood their mother has drawn from her breast — symbolising Christ giving his blood for the salvation of humankind. In the 16th century, after the Turks captured Jerusalem, the room was transformed into a mosque in memory of the prophet David. Its mihrab (a niche indicating the direction of Mecca) and stained-glass windows with Arabic inscriptions remain. According to one early Christian tradition, the “upper room” was in the home of Mary the mother of John Mark. He was the author of the Gospel of Mark (and presumably also the young man who fled naked, leaving behind his linen garment, to escape the authorities when Jesus was arrested in the garden at Gethsemane, an event he recorded in Mark 14:51). This house was a meeting place for the followers of Jesus. It was inside the city walls of Jerusalem, in a quarter that was home to its most affluent residents. It was also the house to which Peter went after an angel of the Lord released him from prison. Acts 12:12-16 says a maid named Rhoda was so overjoyed at recognising his voice that she left him knocking at the outer gate while she went to tell the gathered disciples. The site of the Cenacle was also the first holy place the Franciscans obtained, bought in 1335 through the efforts of King Robert and Queen Sancia of Naples, “after difficult negotiations and huge expenses”. The structures around the “upper room” are in fact remnants of the Franciscan medieval friary. Over the centuries the buildings the Franciscans constructed were frequently destroyed and friars were ill-treated and even killed.